Mauritania is a land dominated by sand and barren soil, located on the western flank of the Sahara Desert. In the eleventh and twelfth centuries, four ksour (villages) arose in Mauritania in order to serve the trade caravans crossing the Sahara. These are Ouadane and Chinguetti in the north, and Tichitt and Oualata in the southeast. These trading and religious centers became focal points of Islamic culture. Once magnificent settlements, these ksour began their decline in the sixteenth and seventh centuries. In the twenty first century they remain—though sparsely populated—as small towns, struggling to survive amidst the encroaching desert. They are the last existing ksour from the medieval era. Though largely victim to wind, sand, drought, and the end of the caravan trade, what remains illustrates a traditional way of life centered on the nomadic culture of the people of the western Sahara. In 1996, the ksour of Ouadane, Chinguetti, Tichitt, and Oualata were designated as a joint UNESCO World Heritage Site on the basis of cultural criteria. They were noted as "exceptional examples of settlements built to serve the important trade routes of the Sahara Desert, and which were witness to cultural, social, and economic contacts for many centuries." The ancient ksour are medieval towns characteristic of the Saharan ksar settlements and are well integrated into their natural environments. Ksour is the plural form of ksar. The Arabic word, more correctly transliterated as qsar, is a term describing a village consisting of generally attached houses, often having collective granaries and other structures such as mosques, baths, ovens, and shops widespread among the oasis populations of the Northern Africa Maghreb region. Ksour were often contained entirely within a single, continuous wall. The building material of the entire structure was normally adobe, or a combination of cut stone and adobe. These highly distinctive, fortified desert villages were the foundation from which cities evolved to become brilliant centers of Islamic culture and thought. The word Ksar is often contained within place names across Northern Africa in Morocco, Algeria, Tunisia, and Mauritania, and is particularly prevalent on the Saharan side of the various ranges of the Atlas Mountains and the valley of the Draa River. 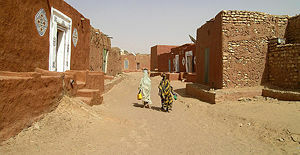 The four towns of Ouadane, Chinguetti, Tichitt and Oualata are the only Mauritanian villages to have been inhabited since the Middle Ages. They were originally built along caravan routes in the eleventh century C.E. across the Sahara. The villages were important trade centers and offered a place where traders could stop for religious practice and instruction. Along these caravan stops sprang up the necessary structures which were centered around the mosque. Homes for teachers and students were built, warehouses for traders, and inns for travelers. The ancient homogeneous form characterized by dense occupation, with the medina layout conforming to the topography. There are narrow alleyways but no open public spaces. The intermediate form reflects the ancient form except that the house plots are larger. The later form which is characterized by large enclosures, with one or two roomed houses. The ancient town plan began from a central mosque, with the town radiating out from that center. Houses and courtyards increased in size the farther they were from the center. The mosques in these towns were very simple, built completely of local material, and lacked ornamentation. Each consisted of a single room or prayer hall with a vaulted ceiling. The Madrasah, or school, was a simple building within the courtyard. The houses were simple, as they were used by nomadic people, and visited only several times per year. They were often used as storehouses. The rooms seemed to not have a fixed function, but varied upon the time of year or situation as needed. Enclosed by walls, each town had a main entrance for caravans. Cemeteries were generally nearby, outside the walls. 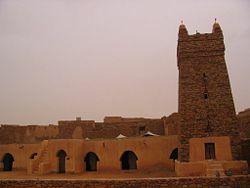 The ksar of Chinguetti lies on the Adrar Plateau east of the town of Atar. Founded in the thirteenth century, as the center of several trans-Saharan trade routes, this tiny city continues to attract a handful of visitors who admire its spare architecture, exotic scenery and ancient libraries. The city is seriously threatened by the encroaching desert; high sand dunes mark the western boundary and several houses have been abandoned to the encroaching sand. The indigenous Saharan architecture of older sectors of the city features reddish dry stone and mud-brick houses, with flat roofs timbered from palms. Many of the older houses feature hand-hewn doors cut from massive ancient acacia trees that have long disappeared from the surroundings. Many homes include courtyards or patios that crowd along narrow streets leading to the central mosque. Notable buildings in the town include The Friday Mosque of Chinguetti, an ancient structure of dry stone featuring a square minaret capped with five ostrich egg finials; the former French Foreign Legion fortress; and a tall watertower. The old quarter of the Chinguetti is home to five important manuscript libraries of scientific and Qur'anic texts, with many dating from the later Middle Ages. In recent years, the Mauritanian government, the U.S. Peace Corps, and various organizations have attempted to position the city as a center for adventurous tourists, allowing visitors to "ski" down its sand dunes, visit its libraries and appreciate the stark beauty of the Sahara. The Chinguetti region has been occupied for thousands of years and once was a broad savanna. Cave paintings in the nearby Amoghar Pass feature pictures of giraffes, cows, and people in a green landscape quite different from the sand dunes of the desert landscape found in the region today. The city was originally founded in 777, and by the eleventh century had become a trading center for a confederation of Berber tribes known as the Sanhadja Confederation. Soon after settling Chinguetti, the Sanhadja first interacted with and eventually melded with the Almoravids, the founders of the Moorish Empire which stretched from present-day Senegal to Spain. The city's stark unadorned architecture reflects the strict religious beliefs of the Almoravids, who spread the Malikite rite of Sunni Islam throughout the Western Maghreb. After two centuries of decline, the city was effectively re-founded in the thirteenth century as a fortified cross-Saharan caravan trading center connecting the Mediterranean with Sub-Saharan Africa. Although the walls of the original fortification disappeared centuries ago, many of the buildings in the old section of the city still date from this period. Qur'an collection in a library in Chinguetti. For centuries the city was a principal gathering place for pilgrims of the Maghreb to gather on the way to Mecca. It became known as a holy city in its own right, especially for pilgrims unable to make the long journey to the Arabian Peninsula. It also became a center of Islamic religious and scientific scholarship in West Africa. In addition to religious training, the schools of Chinguetti taught students rhetoric, law, astronomy, mathematics, and medicine. For many centuries all of Mauritania was popularly known in the Arab world as "Bilad Shinqit, “the land of Chinguetti.” Chinguetti is locally said to be the seventh most holy city of Islam. There is no recognition of this claim outside of West Africa, but whatever its ranking, the city remains one of the world's most important historical sites both in terms of the history of Islam and the history of West Africa. Although largely abandoned to the desert, the city features a series of medieval manuscript libraries without peer in West Africa, and the area around the Rue des Savants was once famous as a gathering place for scholars to debate the finer points of Islamic law. Today its deserted streets continue to reflect the urban and religious architecture of the Moorish empire as it existed in the Middle Ages. The Great Friday Mosque of Chinguetti is an ancient center of worship created by the founders of the city of Chinguetti sometime in the thirteenth or fourteenth century. The minaret of this ancient structure is purportedly the second oldest in continuous use anywhere in the Muslim world. Architecturally, the structure features a prayer room with four aisles as well as a double-niched symbolic door, or mihrab, pointing towards Mecca, and an open courtyard. Among its most distinctive characteristics are its spare, unmortared, split stone masonry, its square minaret tower, and its conscious lack of adornment, keeping with the strict Malikite beliefs of the city's founders. The mosque and its minaret is popularly considered the national emblem of the Islamic Republic of Mauritania. In the 1970s, the mosque was restored through a UNESCO effort, but it, along with the city itself, continues to be threatened by intense desertification. Ouadane (Arabic: وادان) is located in northwestern Mauritania, lying on the Adrar Plateau, 120 kilometers (75 mi) northeast of Chinguetti. It was founded in 1147, by the Berber tribe Idalwa el Hadji and soon became an important caravan and trading center. The village is set on a hillside, blending into the landscape. It is surrounded by an oasis, palmyrah palm trees, and sand dunes. Once an important center of camel caravans, when salt, dates, and gold were the main merchandise, Ouadane has some of the most impressive ruins of Mauritania. A Portuguese trading post was established in 1487, but the town declined from the sixteenth century. The old town, though in ruins, is still substantially intact, its main attraction being the ancient mosque. Situated above the old village is an "upper town," a small modern settlement outside the old town's gate, inhabited by the Berber Idawalhajj tribe. A major trade route connected Ouadane with Oualata (Arabic: ولاته) (sometimes "Walata"), a ksar in the southeast part of the country. Oualata is believed to have been first settled by an agro-pastoral people akin to the Mandé Soninke who lived along the rocky promontories of the Tichitt-Oualata and Tagant cliffs of Mauritania. There, they built what are among the oldest stone settlements on the African continent. The modern city was founded in the eleventh century, when it was part of the Ghana Empire. It was destroyed in 1076 but re-founded in 1224, and again became a major trading post for trans-Saharan trade and an important center of Islamic scholarship. Oualata was a prosperous settlement, especially between the 14th and 18th centuries, such that it appeared on European maps. Trade was not its sole source of wealth; it had become a renowned intellectual center that attracted foreign students. A century ago, this oasis was farmland that produced enough food to feed a population of several thousand inhabitants. Today, the few wind-battered palm trees are dying, half-buried in sand. Today, Oualata is home to a prized manuscript museum. Its buildings are trimmed with white drawings against a reddish-brown undercoat, making the city known for its highly decorative vernacular architecture. The designs on Oualata’s walls are the same as those still drawn on the hands and feet of Mauritanian women. Tichit (Arabic: تيشيت) sits at the foot of the Tagant plateau in south-central Mauritania on the route between Oualata and Ouadane. It was founded c. 1150 and grew into a magnificent city, and was a major trading center for salt. Its multi-storied structures–with blind walls on the ground floor, a door for only opening to the outside and facades built of colored stones–are fragile remnants of typical Mauritanian architecture. Its layout tells the history of the village. The northern section is the Shurfa quarter. This section was constructed in greenish stone, understood to be an expression of the tribe of the Shurfa's claim of decendancy to the Prophet Muhammad. The Masana tribe lived in the southern quarter, where red stone was used. This tribe was the largest in the settlement and known as good merchants. White stones were used for the larger buildings in this quarter. While a variety of colored stones were used, each village section exists in polychrome. Legend has it that seven towns have been superimposed on this site, and the one that has come down to us today is irretrievably sinking beneath the dunes. Many of the houses have been swallowed by sand, only the upper stories of tall structures are visible. In 1999, torrential rains destroyed 80 percent of the town. The mosque and its square minaret survived. Twenty to thirty houses remain in good condition, and are highly ornamented for the region. A few families reside in Tichit, where the main industry in Tichit is date farming. Traces of Tichit's glorious past remain in its vernacular architecture, which is its main attraction. The town is also home to a small museum. ↑ UNESCO World Heritage Centre, Advisory Body Evaluation. Retrieved December 18, 2008. ↑ Rohan Canagasabey, March 22, 2006, Ksours—Mauritania’s ancient towns of Sahara, Leader Publications. Retrieved December 18, 2008. ↑ Tore Kjeilen, TICHIT: The living ghost of yesterday's glory, LookLex. Retrieved December 18, 2008. ↑ Moussa Ould Ebnou, December 2000, The Treasures in Mauritania's Dunes, UNESCO Courier. Retrieved December 18, 2008. Archnet. Great Mosque of Chinguetti. Retrieved December 18, 2008. Canagasabey, Rohan. March 22, 2006. Ksours—Mauritania’s ancient towns of Sahara. Leader Publications. Retrieved December 18, 2008. Kjeilen, Tore. OUADANE: The old caravan centre. LookLex. Retrieved December 18, 2008. Kjeilen, Tore. TICHIT: The living ghost of yesterday's glory. LookLex. Retrieved December 18, 2008. Mauny, Raymond. 1971. "The western Sudan." African Iron Age. OCLC 36788782. Monteil, C. 1953. "La legende du Ouagadou et l'origine des Soninke." Melanges Ethnologiques. OCLC 39529024. Ould Ebnou, Moussa. December 2000. The Treasures in Mauritania's Dunes. UNESCO Courier. Retrieved December 18, 2008. UNESCO World Heritage Centre. 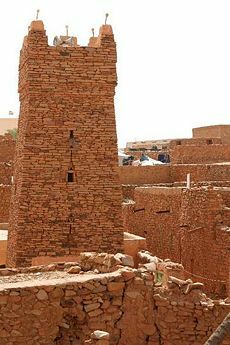 Ancient Ksour of Ouadane, Chinguetti, Tichitt and Oualata. Retrieved December 18, 2008. Werner, Louis . November/December 2003. 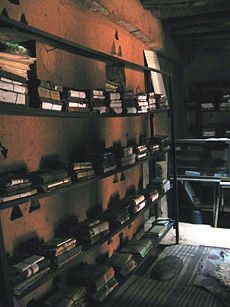 Mauritania's Manuscripts. Saudi Aramco World. Retrieved December 18, 2008. World Monuments Fund. Chinguetti Mosque, Mauritania. Retrieved December 18, 2008. Wuld Ibnū, Mūsá. 2000. "The treasures in Mauritania's dunes." Unesco Courier. OCLC 47900029. All links retrieved September 14, 2016. This page was last modified on 25 April 2018, at 14:54.